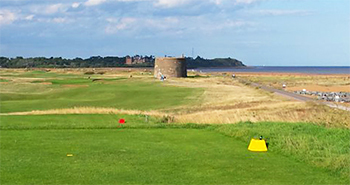 “I have the tenderest and most sentimental association with Felixstowe,” wrote Bernard Darwin in The Golf Courses of Great Britain, “because it was there that I began to play golf. I did not see it again for a painfully long number of years, and my recollections of it were those of a small boy of eight or nine years old. The small boy wore a flannel shirt, brown holland knickerbockers, and bare legs, from which the sun had removed nearly all vestiges of skin. He used to dodge in and out of the crowd, hurriedly playing a hole here and there, and then waiting for unsympathetic grown-ups in red coats to pass him. Willie Fernie was the professional there in those days, and in the zenith of his fame; it was not long before he had beaten Bob Ferguson for the championship by holing a long putt for a two at the last hole at Musselburgh. Occasionally also another great golfer, Mr. Mure Fergusson, would come down from London to shed the light of his countenance upon the course and be breathlessly admired by the small boy from a respectful distance. As far as I can remember, my best score then was 70 for one round of the nine-hole course, and so I always pictured Felixstowe to myself as possessing longer holes and bunkers infinitely more terrible than those to be found on any other course. Felixstowe revisited appeared naturally enough to have shrunk a little; the Martello tower was not quite so tall as I had pictured it, but I still found it one of the most charming and interesting of courses. As far as I could see, the course was almost exactly the same as it always had been. The names of the holes came back to me as I played them – the ‘Gate,’ the ‘Tower,’ ‘Eastward Ho!’ ‘Bunker’s Hill,’ the ‘Point’ – with a romantic thrill. The Martello course at Felixstowe Ferry Golf Club is the only links course in Suffolk and one of only a handful in East Anglia. This makes it a highly desirable venue for a number of golfers, visitors especially, who seek out all-year round play on fast draining, running ground. The view from the clubhouse is one of the loveliest and far-reaching I have come across. The entire course and coastline stretches out before you. The opening tee shot is one of the most inviting you will play. However, there is no denying that the holes on the inland side of the course, divided by a road, lack the sparkle, charm and character of the others. I too have a sentimental association with Felixstowe Ferry – nowhere near in the same league as Bernard Darwin, who might have had very good reasons to award Felixstowe the highest rating. I used to play Felixstowe regularly when my home courses in Essex (where I used to live) were deep in mud during the soggy winter months. I always enjoyed playing Felixstowe, largely due to the respite from the Essex sludge and the fact that the condition of the Martello course was (and probably still is) unusually good all year round. Design wise Felixstowe is not links excellence. To counterbalance the last two rather fawning ratings, I assert that Felixstowe is a good course but not an excellent one. Brancaster and Hunstanton, further to the north, are significantly better courses and there may even be one hundred links courses in Great Britain and Ireland that are superior to Felixstowe. Felixstowe is a hidden gem of a course. Laid out in parallel to the coastline it is a fantastic place to be even if not playing golf. The views across the sea and the inland river and marshes are simply stunning. The course itself is basically links and you can be sure of the usual amount of quirky bounces, best you brush up on pitch and runs and Texas wedges before coming. None of the holes are easy but 13 to18 are outstanding requiring accurate tee shots and pin point approaches to the very sloping greens. When the wind is blowing you will have your hands full around this track. Glenn the Head Greenkeeper keeps the course in tip top condition all the year round (no temporary greens here) and Head professional Robert and assistant Peter in the pro shop cannot be more helpful and welcoming. There are some excellent courses in this part of Suffolk but Felixstowe is as good as any of them and better than most, I thoroughly recommend a visit. I'd just like to say that we all really enjoyed out time at Felixstowe Ferry Golf Club. The course was in fantastic condition for the time of the year! We particularly enjoyed the layout and decision making for your shot selection. I would highly recommend it to all golfers as it is truly enjoyable. I'd also like to thank Rob Joyce a fellow PGA member for being so welcoming and helpful on our visit. Fantastic condition, layout and staff. Thank you very much! Referring to the reviewer below me, I think for everyone who plays at Felixstowe the favourite holes would be the stretch from 13 to home as it is here you find some proper undulations and interesting holes. As for the rest of the course....a good course (3 balls) with enough to suggest it is a links course but if holes 13-18 did not detour away from the first 12 holes then it would be a fairly mundane course, say on a par to Lochgreen, Moray New or St Olaf. But because it does it is a decent, not strong, 4 baller. If I had the choice to play this or Troon Darley it would be a toss of the coin. Between say Felixtstowe or Seacroft, Seacroft in a heartbeat. Not quite enough to get excited by. What also didn't help was the (I'm guessing) Asst Pro suggesting that Felixs is better than Cruden Bay as the views are the only great thing about CB, well, that set my expectation very high and it is obviously not in the same league as Cruden Bay. Warren from Australia. The course is pretty much divided in two by a public road. Holes 1-3 and 13-18 are on the sea side of the road and have a more natural true links feel. These seaside holes are also rather more exposed to the wind which can get pretty strong here at times. The par three 5th marks the beginning of seven holes where a burn is in play. The burn is on both sides of the fairway on the 7th, 8th and 10th holes. Whilst the 11th has the burn on the right hand side, there is also the road and an out of bounds along the left. The 14th and 15th are two of the newer holes (following previous coastal erosion) and can play longer into the wind than their yardage would suggest. These holes have a different architectural feel as a result of being the work of Martin Hawtree. The 17th is a long par four dominated by the presence of the famous Martello tower, which dates back to the Napoleonic Wars. The 18th is 321 yards and uphill but with summer fairways and a following breeze it is almost drivable. A ridge across the fairway and three greenside bunkers are the main obstacles but a straight drive should leave just a short approach. Played this course in mid April and was very impressed. Despite being a Links course addict Felixstowe Ferry had never really been on my hit list to play.. what a fool I am! This is a fantastic Links - if it's good enough for Bernard Darwin to pay it his full attention then it should be good enough for all of us, whether Links lovers or otherwise.. The holes at the higher end of the course offer not only stunning sea views, but really are fantastic Links holes. From what I've heard the club are putting great effort into improving the course to make it look and play like the true Links that it is - adding traditional Links fescue grasses where needed, as well as revetting many of the bunkers. It seems the good work is paying off already, and as it continues, Felixstowe Ferry will continue to get better and better. I can't wait to return and play it again! it would be remiss of me also not to mention that the clubhouse does one of the best fish and chip lunches in the world!? Or that the stock and facilities available in the Pro Shop wouldn't be out of place in a high end 'country club'? I could ramble on all day actually. Sadly, I need to have a cup of tea and a treat.. So i'll leave it at that! Go play Felixstowe Ferry, you wont be disappointed! Felixstowe is a lovely place to play golf, nice and flat but enough undulations to make it interesting, the grasses are excellent and a very friendly club indeed. 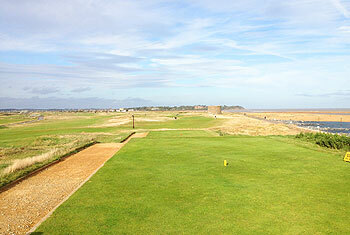 Four of us played the Martello course on Saturday 26th March, we played £50 each. I thought this was a bit pricey for a winter rate and for what the course was. Don't get me wrong I enjoyed the course, the greens were fantastic, the last 6 holes were superb and we were very appreciative to be let off 15 minutes early to beat the darkness but I agree with some of the other reviews that there is something missing. I think it might be the lack of fairway undulation and dunes and also the middle 6 holes are a bit parklandish but I can't complain as I got a hole in one on the 5th! BB.